About 70 protesters have staged a demonstration at a cricket match involving the Israeli national team. 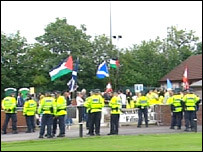 The Stop the War Coalition said the match in Glasgow should not have taken place during the Middle East conflict. The team were playing Norway in a European series match in Anniesland. Security was tight, with dozens of police outnumbering the protesters. They said other countries involved in conflict were not targeted for similar demonstrations. Speaking on Friday, Dr Kenneth Collins, of the Glasgow Jewish Representative Council, said: "This country currently has a large number of soldiers in Iraq, as have the Americans. "I haven't seen demonstrators trying to disrupt Scottish and English football matches, American baseball games or other things, why is it just the Israeli teams that they pick on?" Campaigners from the Stop the War Coalition said the team visit should not have gone ahead while Israel was fighting Hezbollah in Lebanon. The Muslim Association of Britain had called on the Norwegian players involved to refuse to take part in the match. Spokesman Osama Saeed said: "The fact that it has to be played behind closed doors says it all about how Israel is viewed. "This hasn't just been down to Muslim anger as many pro-Israelis have tried to claim. It is because of the joining of hands of decent just-minded Scots up and down the country." The European Cricket Council (ECC), which is organising the tournament, wanted to avoid a repeat of Israel's last game, which was abandoned on public safety grounds. In a statement, the council said: "The ECC and the ICC appreciate the right of every citizen to take part in peaceful protest and understand the reason behind the protest in this instance. "However, the ECC and the ICC appeal to the protesters not to disrupt the matches. "Such actions would affect not only the Israel team but also every other team in the tournament." The council expressed sadness and sympathy for those suffering as a result of the Middle East conflict. It added that all players - who are amateurs - had the right to play in the tournament, regardless of race, colour, creed or religion. Strathclyde Police said officers had been in close discussion with representatives of the ECC and protest groups over the past few days. Assistant Chief Constable Ian Learmonth said: "I am pleased to say that today's event passed without incident and we are pleased the protestors stuck to their agreement to stage a peaceful demonstration. "This was as a result of hard work by the police to facilitate both the rights of those playing cricket and those who wished to demonstrate." He urged anyone planning to demonstrate at Israel's next game on Sunday to do so peacefully.